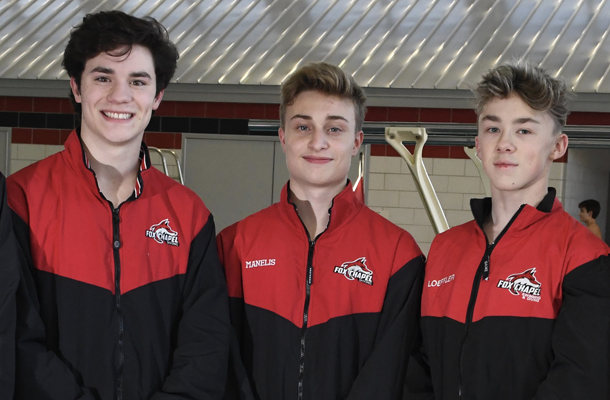 It didn’t take long for senior divers Jonah Cagley and Magnus Loeffler and sophomore David Manelis to qualify for the WPIAL Class AAA championships coming up in February. In fact, they did it at the very first meet of the regular season. 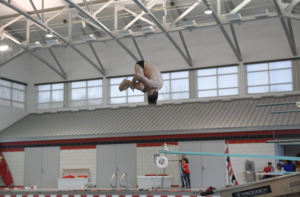 In order to qualify, divers must attain a cumulative 9.7 difficulty on five optional dives performed at dual meets, score a minimum of 175 points, and successfully complete dives from every category – front, back, reverse, inward, and twist. Jonah has been there, done that – multiple times. The Duke recruit and Foxes’ scoring record holder has moved into the postseason the last four years. As a sophomore and junior, he was the WPIAL Class AAA champion, and as a freshman placed second. Jonah also advanced each of the past three years to the PIAA Class AAA championship, where he finished third two times, and was 11th in his freshman year. Magnus, who also has advanced to WPIALs all four years, was “discovered” by coach Vernon Yenick when he was only 10-years-old. “I was just diving for fun at Chapel Gate when he asked me if I had ever dived before (competitively). I signed up for a clinic after that and then I joined the Pitt Aquatics Club for three years and got instruction from high-level coaches,” says Magnus. David, the youngest of the qualifiers who made the team’s “300 Club” honor roll (for reaching 300 points in one dual meet) last year as a freshman, got a taste of the WPIAL and PIAA championships in his first year on the team. This year, his coach praises him for improving his hurdle and jump, and says his diving is a lot smoother, and he’s added more difficulty to his repertoire. Like his two senior teammates, David spends a great deal of time diving for the elite Pitt Diving Club and participates in four-to-seven meets a year under the umbrella of USA Diving. Click on image for slow motion video.